The entire argument for gun control is built upon a false premise. The second amendment is not about self-defense from criminals. A proper debate on one’s right to keep and bear arms is NOT one that is framed in the terms of whether you can feel safe from wicked and depraved people, full of hate and malice, who want to hurt you. You will NEVER feel safe from those people and those people will not cease to exist just because YOU are not allowed to legally own a gun. Why? Because those people do not care about laws and they will always find a way to hurt and destroy, with or without gun laws. If the answer to that question is “no,” the gun control debate is over. It is important to note that Coxe, who was present during the debates on the wording of the amendments, openly stated that the 2nd Amendment is also meant for the citizenry to be armed to protect itself FROM militias which might be misused. 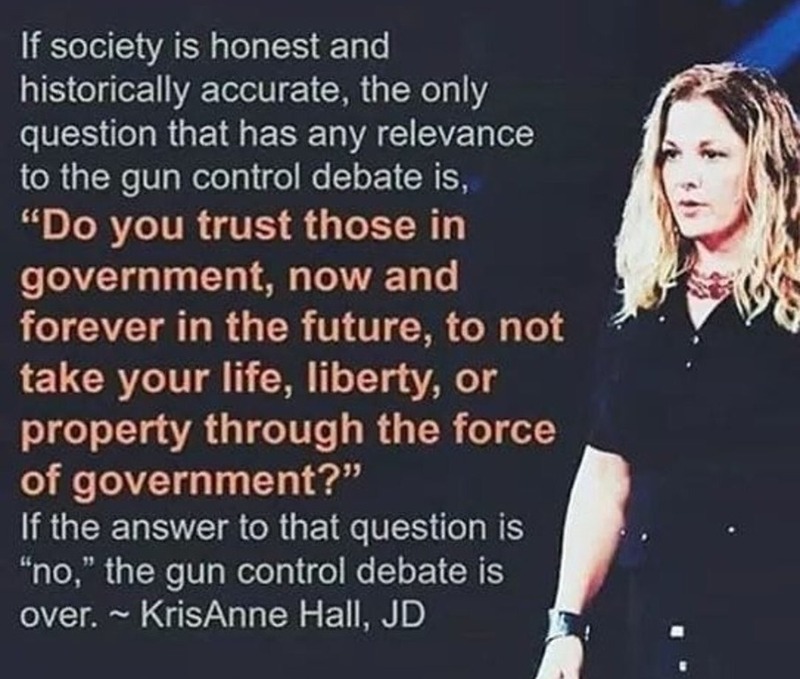 His quote made so soon after the drafting of the amendment is probably the best statement of the contemporary thoughts regarding the purpose of the 2A that I’ve ever read. Read in the light of Coxe’s statement the Militia Clause isn’t only a statement of purpose that having the people armed makes raising a militia quicker, but as a warning that while raising militias is an essential evil to protect the country but that the people need to be armed to repel the militia as well. To further add weight to her argument, the words of Leftists, who all vowed to “Resist” and the actions of the AntiFA who donned black clothing and masks to to beat opponents and bystanders, prove that they agree with her, though they deny that agreement. One does not knowingly, willingly, and voluntarily disarm oneself and surrender one’s effective means of self defense to a Hitler, whether he is literally or only figuratively Hitler. America….are IDIOTS. They are incapable of reason, logic or rational thought. ANY means necessary. There is no ‘common ground’, no meaningful discourse. There is NOTHING to talk about. We have guns. They don’t want us to have them. They will do ANYTHING required to achieve that goal. Either we KILL THEM or we surrender and many of us DIE. You do NOT negotiate with people who view you as slaves to be subjugated.